An elderly Singaporean has decried the $482 monthly retirement sum the Central Provident Fund (CPF) Board has allegedly said it will give him from his CPF savings over the next 28 years. 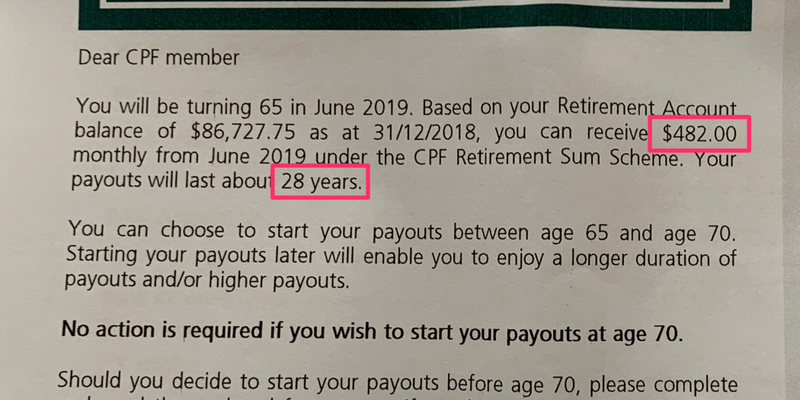 Surprised by the “illogical” 28-year payout period, the 65-year-old senior citizen asked the CPF Board to shorten the payout period to 20 years, so that he could get a greater monthly payout over a shorter period since he will be 93 years old by the end of the current arrangement. CPF Board allegedly rejected his request since doing so would “deplete [his] RA savings prematurely”. The email reply that Zol attached in his letter showed that Zol will receive pro-rated monthly payouts since he does not have the cohort Full Retirement Sum of S$106,000 in his Retirement Account to qualify for $910 monthly payouts. CPF Board further explained that interest components such as the Extra Interest and Additional Extra Interest will help “extend the duration of members’ payouts to ensure they do not outlive their retirement savings as much as possible”. Asserting that he is “not asking the Government to feed me” and that he is not looking for a handout, the senior asserted that the CPF Board is “only a custodian of members’ CPF savings,” and should consult members and give members a say in accepting policies. Two incumbent ruling party MPs have actually filed questions asking for revisions to CPF’s payout mechanism. Three other incumbent PAP MPs, however, have publicly expressed support for the existing “opt-in” payout mechanism as the “most logical and efficient” arrangement.